The Suzuki Hayabusa is Suzuki’s super-fast sport bike that has been in production since 1999. With top speeds of 303 to 312km/h, the Hayabusa is the fastest production motorcycle on the planet. The name 'Hayabusa' is Japanese for the peregrine falcon and is often used as a metaphor for speed as displayed by the bird’s vertical diving speeds during hunts. The Hayabusa won immediate acclaim when it surpassed the Honda Super Blackbird as the world's fastest production motorcycle by at least at 16 km/h. The Hayabusa has a light weight chassis design with a rigid twin-spar aluminium frame that gives it incredible high torsional strength while maintaining its weight low. The bike also has an aluminium alloy swing arm built in a cross-sectional shape to give improved rear tire grip, enhanced rigidity and increased engine output. The meticulous design affords the bike great aerodynamics, stability and remarkable style. Some of the top features of the Suzuki Hayabusa include adjustable engine rpm indicator, tachometer, four analogue metres for speedometer, gear position indicator and water temperature and fuel gauge with a S-DMS mode indicator. It also features stylish, vertical stacks of twin headlights that provide increased light distribution and intensity when needed. The Hayabusa has a DOHC liquid cooled, 4-cylinder fuel injected 1340cc in-line engine with 16-valves and Twin Swirl Combustion Chambers (TSCC) that give the super motorbike phenomenal power. The engine is fed via Suzuki’s Dual Throttle Valve (SDTV) fuel injection system that consists of dual 12-holefine-spray injectors per cylinder and large volume airbox for ram air intake. The Hayabusa's engine coupled by its remarkable design makes it the number one mile cruncher in its class. A single twist of the wrist in any gear can provide breathtaking acceleration in a matter of seconds and give the ultimate road bike experience in terms of performance, comfort and manoeuvrability. 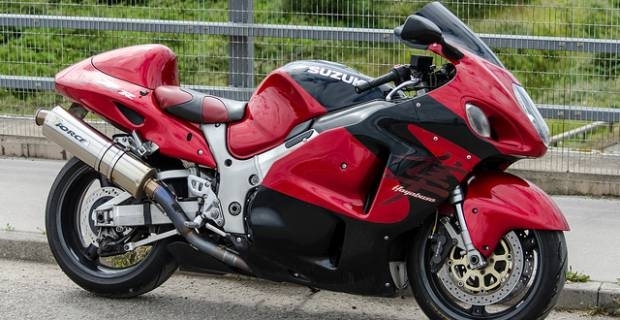 The Suzuki Hayabusa is not for everyone. The motorbike is designed for serious sport riders who want nothing but the best. Its phenomenal power and performance makes it the world's fastest and most exciting sport bike. It rewards with a combination of exceptional handling, superb aerodynamics, crisp styling and unsurpassed power. This is the ultimate sport bike. Is there more you would want?